FSC-88 WB is a sprayable, brushable, rollable water-based primer and filler that is used to fill and smooth Precision Board HDU. It is not intended for tooling use, but can be used for cosmetics in some industrial applications. Call us if you have questions. 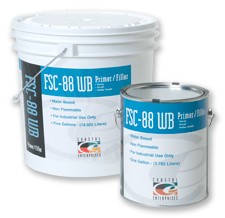 Use FSC-88 WB when a smooth surface is desired, or as a primer to ensure paint adhesion. It dries rapidly and sands easily. FSC-88 WB also works well on wood, concrete, and metal. Prior to using FSC-88 WB HDU Primer, use FSC-360 WB HDU Crack & Repair Putty to fill cuts, dings or any other damage.